We teach you to teach your dog using low stress positive motivational methods with few corrections. Praise and food rewards are used so dogs and owners gain mutual trust and respect and dogs learn to work happily and reliably without fear. Class sessions are for you to learn how to teach your dogs so that you can practice at home. Registration is necessary so our class size is predictable. All class starting dates are tentative. Please call or stop in for a registration form or download a registration form. You must call before mailing in your forms to check that there is space available. Receipt of completed application and check for payment in full will reserve you a space in the class of your choice. If there are fewer than 5 paid registrations for class 2 days before it is scheduled to begin, the class will be rescheduled for a later date. If a class has reached the enrollment limit of 8 dogs when we receive your application, your name will be added to a waiting list. Classes meet once per week beginning on the date listed and continue on the same day and time each week. Each class lasts approximately 55 minutes. Treats are used in our classes as a means of reward for desired behavior. Treats used for training should be soft or semi-soft and something that can be easily eaten by the dog in one bite (cheese, hot dog, Cheerios, kibbled dog food, small bits of vegetable.) Various types of training treats are available for purchase. Video Tapes featuring the latest training methods and other helpful dog information are available to view at no charge at the Training Center or can be rented for up to 1 week. Class enrollment: Plan to arrive 10-15 minutes before class time to complete enrollment and walk your dog before bringing him to class. Please keep him leashed and at your side at all times because not all dogs may be as friendly as yours! Save his dinner until after class to keep accidents to a minimum. Please help us keep the walk area clean by scooping after your own dog. Thank you! Fees: Fees are non-refundable unless we cancel the starting date of the class. No exceptions. You may observe our class anytime to see if our methods will suit you before you sign up. Unused classes may be taken as make-up classes, but cannot be used as credit toward other courses. Current vaccinations for Rabies DHL (distemper combinations) and Bordetella (kennel cough) are required for all dogs enrolled in classes, play groups or daycare. Please bring all vaccination records when you enroll for your class. Dogs without the required vaccinations will not be accepted into class. Fleas! – Every dog must be flea free to attend any class, daycare or play group. If your dog has fleas, please arrange with our staff to remedy the problem before attending class with him. Fleas can spread very rapidly from one animal to another, and we all need to keep our center flea-free! We need 5 participants to begin any class. Please note there are no training classes until spring while we search for a new trainer. Subject to change. Must have 5 participants. Please contact us to confirm class dates and times BEFORE mailing in forms. Puppy Kindergarten is a great way to get your puppy off to a positive start and keep him from learning bad habits. We offer flexible enrollment so puppies at least 8 weeks old and not yet 16 weeks (14 weeks for larger breeds) may join at any time. Puppies may participate in Puppy Kindergarten for 6 classes or until they are 20 weeks old, whichever is first. We teach new owners how to start puppy training in a happy, positive way and also about proper puppy care. Puppies have a great time playing with other puppies and learning social skills necessary to be a good pet. It is very important to a dog’s social development to be able to interact with other dogs and puppies of similar age. This helps them learn how the “pack” operates and where their place is within the pack. This important part of socialization must happen at a young age to help them learn to interact with other dogs as they grow up. Interaction with other young puppies is especially important for puppies from single puppy litters or those who left their littermates before 7 weeks. This class is great preparation for the Level 1 Obedience class where real obedience training begins. Your puppy may begin classes any week, just call for sign-up information. Level 1 is a beginning obedience class for all dogs over 4 months old. 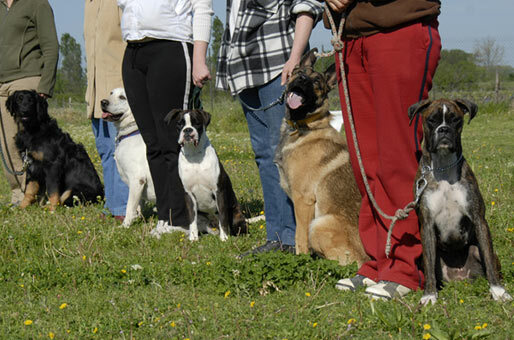 Owners learn how to teach the basics of good behavior using positive reinforcement. Dogs are taught to sit, lie down, stand, stay, come when called and heel on a leash without pulling. Other behaviors, such as jumping on people or excessive barking will be addressed, according to the specific needs of the dogs in each class. Level 2 is to help polish Level 1 skills and begin working off lead. This class is to help the dog that already knows the basics to become a dependable obedient dog. 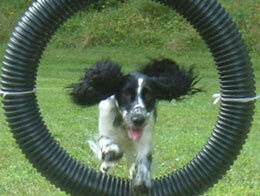 Some Clicker Training and beginning jumping and retrieving will be started to keep it fun and challenging for the dog. Prerequisite: A basic Obedience course or the dog must know the commands: sit, down, stand, stay, come and heel. Level 3 is geared toward the dog becoming dependable off lead in all situations. More advanced jumping and retrieving is taught. Emphasis is on keeping the dog working happily and willingly. Novice training will be available for those who wish to compete in Obedience trials. Level 4 is for any dog that has mastered all the skills in Level 3 and is ready for new challenges. Training at the Open Competition level. All work is done off lead, so dogs must be completely trustworthy with other dogs and people. Level 5 is for training at the Utility level. All dogs are completely off lead for this class. Dogs in competition must have earned the CD title before enrolling in the class. All others must be able to perform the CD routine at the competitive level. Scent discrimination and directed jumping and retrieving will be emphasized. Dog in Level 5 must absolutely be trustworthy with all dogs and people. Classes held 3 or 4 times a year. Helps prepare for competition or just for a change in things to do with your dog. Must have Level 1 Obedience. Agility is a great way to get a little exercise with your dog while teaching you to work together. Dogs learn to negotiate an obstacle course with jumps, tunnels, ramps and doggie-type playground equipment. Advanced dogs learn speed, accuracy and to follow handler’s signals. 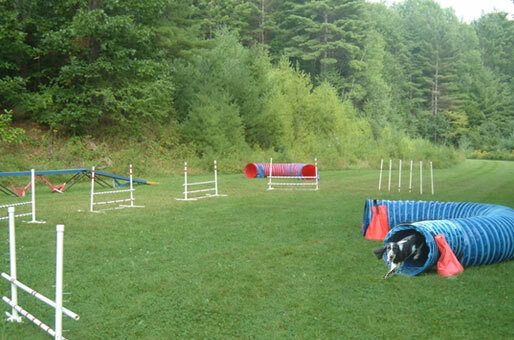 Agility is exciting and challenging for all types of dogs, large and small. It’s a great confidence builder and helps keep an energetic dog busy. Call for details. Canine Good Citizen testing is open to all Level 2 graduates for $10. The fee is $20 for all others. Puppy Temperament Testing is available by arrangement. Please call for details. $50 for the first 5 puppies and $6 for each additional. 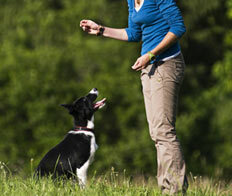 Debbie’s dog training philosophy focuses on positive reinforcement. In puppy kindergarten and the first levels of training she trains people to train their dogs so they can have a dog they can live with. In the upper levels the training focuses on obedience and agility with preparation for the show ring as an option. Debbie won her first obedience title when she was only 10 years old with her Pekingnese. She took her first dog training instructor class in 1979 and started her own training classes in 1988. Debbie opened Complete Canine in West Lebanon in 1994 as a training and dog daycare business. She was one of the first to offer puppy kindergarten as well as agilty classes in the Upper Valley. In 2000 she moved Complete Canine to its current location allowing her to add overnight boarding and grooming. Debbie has had great success showing dogs in both obedience and conformation competitions. Over the years Debbie has worked with many types and breeds of dogs including her own German Shepherd and Basenjis. 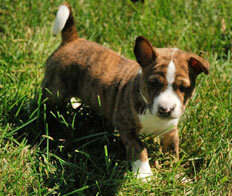 She is also a top breeder of show-quality Basenjis at Mata Hauri Basenjis.